It was one tweet and 14 words, but for defenceman Michael Del Zotto, it was a big deal to herald his new deal with the New York Rangers, a two-year contract he signed as a restricted free agent in mid-January. His teammates were also quick to take to Twitter to offer their congratulations. The Rangers, who finished first overall in the East in 2011-12, recording 51 wins and 109 points, were sent to the sidelines in six games at the hands of the New Jersey Devils in the Eastern Conference Finals. Del Zotto, who was the celebrity guest for a major horse race event at Mohawk Racetrack, just outside of Toronto, last June, hasn’t forgotten how he felt when he spoke to the media that day. So, while there were no set expectations last year, there certainly is as the 2012-13 campaign draws closer. “This is my fourth year here now and this is the tightest group we’ve ever had,” offered Del Zotto, who recorded 10 points in 20 playoff games last year. “I believe we are getting better and better and that has shown in our success on the ice. We stand up for another. Everyone works together for that one goal, to win the Stanley Cup. 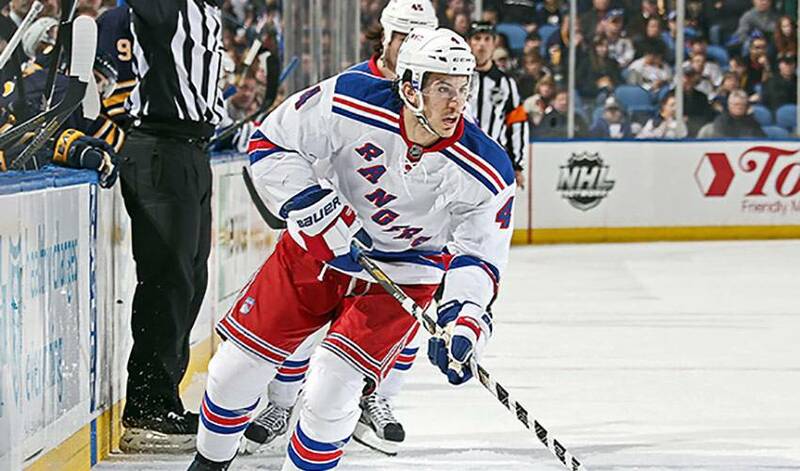 Del Zotto, the 20th overall selection of the Blueshirts in 2008, can look back on last season with pride. He contributed 41 points (tops among all Rangers defencemen) in 77 games. More importantly, in his eyes, the blueliner was able to shed his image as a one-dimensional player. The end result was a slew of career-high marks: goals (10), assists (31), points (41), plus/minus rating (plus-20), blocked shots (95), shorthanded goals (one), shorthanded assists (two), shorthanded points (three), game-winning goals (two), and shots (113). Still, Del Zotto, who played on a PeeWee hockey team, the Markham Waxers, with fellow NHLPA member and 2-time NHL All-Star, Steven Stamkos, expects more from himself. The Rangers begin their quest for a fifth championship on January 19 on the road against Boston, before playing their first home game one night later against Pittsburgh. As for what will make it a successful season for Del Zotto, he didn’t mince words.